We have already considered the motions, phases and appearances presented by the planets which are included by the orbit of the Earth. We have also extended our view to the planet Mars, which is next in order to our globe. Beyond this body are situated four small bodies whose diminutive size would have ever hid themselves from our sight without the assistance of the telescope. These are on many accounts remarkably worthy of our attention. The recency of their discovery, the smallness of their magnitudes and the nearly equal periods of their revolution round the Sun, these and the numerous other points in which they differ from the rest of the planetary bodies with which we acquainted combine to give them a singular interest. There is, however, another point of view in which these bodies appear in no less striking light. A law has been discovered to which all the planetary bodies are submitted. This law was incomplete until the discovery of these bodies, but it is now found to prevail throughout the system. Some astronomers have contended that it is a law of Nature, whilst others have attributed the coincidence entirely to chance. I now propose to trace the history of this singular question and the consequences to which it leads. In explaining the law itself I fear I shall necessarily appear abstruse, for this the nature of the subject will, I hope, be a sufficient apology. It is needless to collect the vague notions of a few of the ancients respecting the number of the planets. They were for the most part conjectures without the slightest foundation. Kepler was the first who had some notions real or imaginary respecting the number and distances of the planets. He even pointed out two vacancies in the system in which he supposed new ones ought to be discovered. Kepler imagined every thing in Nature must be harmonious. He conceived certain mystical properties to be attached to numbers, and imagined that there must exist some law which should connect together these wandering stars. These were the objects of his constant enquiries of his ardent pursuit and the result was the discovery of those laws which have received his name. These have subsequently been confirmed by the investigations of the mechanical philosophy but at the time of their discovery they were merely the results of trials and were only judged to be true from their coincidence with fact. This is the only kind of evidence which can be offered for the law we are about to consider. Kepler spent a considerable time in endeavouring to find by trial whether there did not exist some relation among the distances of the planets from the Sun, but after a long and unsuccessful labour he gave up the task in despair. All his calculations were overturned from the want of a planet situated between Mars and Jupiter, and that such an one did exist he strongly suspected but could not discover any law nor assign the distance at which it should be placed from these two bodies. Titius, a professor of Astronomy at Wittenburg, was the next who applied himself to these researches. After much labour he found out a law to which all the planets then known accorded , and from this he concluded that there must be a planet situated between Mars and Jupiter, and he even determined the distance at which it ought to be placed from the Sun. the law which Titius discovered was this: the distance of the planets Mercury, Venus, the Earth, Mars, Jupiter and Saturn may be represented by the numbers: 4, 7, 10, 16, 28, 52, 100 [and] 196. If now from each of these quantities we subtract the number 4 and if we divide the remainder by 3 the result will always be a power of two. This is very nearly true for all the planets that were known at the time. Titius lived, but there was a vacancy between Mars and Jupiter at the distance of 28. According therefore to his theory he concluded that some one would be found to be situated between them. These observations were made before the discovery of Uranus by Dr. Herschel in the year 1781. The proportional distance of that planet is 196, and it is somewhat remarkable that this number corresponds with the law of Titius, for if we subtract four from it there remains 192. This divided by 3 gives 64 which is the 6th power of two. Dr. Herschel's planet then is in a certain sense a proof of the law discovered by Titius. It was found out after the law was known and is situated at the precise distance which that law indicated. We shall find however that there is another perhaps a stronger proof. The law of Titius does not seem to have excited that astonishment which so singular such a subject might have been expected to create. It was, however, much considered in Germany, and met with many warm advocates. It excited a strong belief in the assertion of Kepler that another planet must exist between Mars and Jupiter. This was so much increased during the latter years of the last century, that Bode who was quite a convert to the opinion wrote to appoint a meeting to consider of the best means of discovering the supposed planet. Those who found the journey inconvenient sent word that they would undertake a share in any of the labour which might be resolved on for this purpose. Gothe in Saxony was the place appointed for the meeting and here were assembled Bode, Lalande, Schroeter, Harding, Olbers and many others of the most respectable observers in Europe. The result of their consultation was that they would divide the heavens in zones of a few degrees each and that each astronomer should take one of these zones and examine scrupulously every star it contained above a certain magnitude. This was the plan adopted. So each observer was appropriated a zone and to those who were absent an account of their task was sent. Piazzi, an astronomer at Palermo in Sicily, had one of these zones assigned to him. He was at that time occupied in a description of the starry heavens and consequently had occasion to examine other parts besides that which was appointed to him. In this pursuit he was occupied when he observed one evening the 87th star in the Zodiacal Catalogue of La Caille situated between the Ram and the Bull. Near this he perceived a small star of the 8th magnitude which he thought an unknown one, and it appeared to possess a proper motion of its own. This happened on 1st January 1801 and according to his usual custom he wished to observe it on several of the following days for the purpose of determining its position with better success. He made several other observations and perceived a motion in the star and suspected that it might possibly be a new planet. To verify this conjecture he resolved on following the motions of this body very assiduously, but a dangerous illness he was attacked occasioned by excessive fatigue had nearly at once deprived the world of the astronomer and his discovery. When he was sufficiently recovered to pursue his observations the star was no longer visible to the Earth; it had disappeared in the rays of the Sun. Piazzi now reconsidered his former observations. These were the only guides he had to conduct him in his search after this new body. He found that they accorded very well with the supposition of its moving in an ellipse. These conclusions were similar to those of Burckhardt, an astronomer of acknowledged skill, and confirmed him in the idea of its being a planet. He therefore gave it the name Ceres to inform posterity that Sicily which was formerly consecrated to this goddess was the place from which she was first discovered. The new planet, however, was not easily rediscovered from her extreme minuteness. She escaped all observation. The greater part of the year 1801 was employed in searching for her. After many fruitless attempts she was again found by Zach on the 31st December and by Dr. Olbers on the 1st January 1802, that is just twelve months after her first discovery. These gentlemen, however, were not the first to whom the planet became visible. On the 7th of December it had been observed by Gauss, and as it affords a remarkable instance of the powers of [Mathematical] Analysis I shall mention the circumstances attending it. "All hope" observed this excellent mathematician, "of again gaining a sight of this planetary atom depended entirely on our being able to find its orbit with a sufficient degree of approximation from the few observations that were made on it when visible. I could not" continued he, "desire a better opportunity of trying whether my ideas on this subject were of any practical utility than by using these observations for the determination of the orbit of Ceres." This planet had during 41 days only described an arc of 3 degrees and now after the lapse of a year it was to be sought for in a far, distant part of the heavens. The first applications of Gauss' method was made in the month of October of 1801. And on the first fine night which occurred he directed his telescope to that precise spot in the heavens which it ought to occupy from his calculations and the planet was immediately visible. This is a striking instance of the perfection which theory has attained. With only 3 observations on a new planet we may find its distance from the Sun in a rough manner, and with a very few more we may approach tolerably near the truth. From the new observations which were now made on this planet it was found that she completes her circuit round the Sun in about 1,618.5 days or in 3 years 7 months 10 degrees. Having thus discovered the nature of her orbit and the principal irregularities to which she is subject there is no longer any danger of her eluding the enquiry of astronomers. The discovery of this minute planet has suddenly changed many of the received opinions concerning the Solar System. The extent of the Zodiac in which the motion of the planets was confined was 16 degrees. This was the Zodiac of the ancients, but Ceres has extended these limits and requires a zodiac of 37 degrees, which is more than double the extent of the former. The apparent inclination of her orbit varies from 11 degrees to 18 degrees. She has also disarranged our ideas respecting the rank established among the bodies which constitute the planetary system. Nature appeared to have placed the largest under the immediate dominion of the Sun and around these smaller bodies or satellites revolved, but this arrangement is destroyed. Ceres is one of the smallest bodies of the planetary system. Her apparent diameter does not amount to 1 minute of arc according to Dr. Herschel and from this it would follow that her real diameter is 17 times less than that of the Earth or that our Moon is five times as large as the planet Ceres, and yet this diminutive body does not describe a narrow circle round some primary planet but pursues her lengthened course through the heavens beyond the orbits of the Earth and Mars. The discovery of Ceres has by some been regarded as the effect of accident, but it should not be considered in such a point of view. It is the honourable fruit of an immense labour. It is the well deserved reward of the care and attention bestowed by its author on the formation of his catalogue of fixed stars. This skilful observer never placed any star in his catalogue until he had viewed it on several successive nights, and it is owing to these repeated observations that the discovery of Ceres must be attributed. It was difficult from its extreme smallness and it has become more glorious to its author from the important consequences which have followed. It was in examining the path which this body describes in the heavens that the other planets have been discovered which were before equally unknown. The most singular circumstance attending this new planet is that it occupied the interval between Mars and Jupiter which was predicted by Kepler, and that its distance corresponds very nearly with the law discovered by Titius. In fact 28 = 4 + 3.2. This remarkable law occupied much of the attention of the German philosophers. It must however be confessed that it is not completely accurate, yet it so far agrees with the truth as to excite considerable surprise and to make us almost doubt whether it could be the effect of accident. Whatever it may be planets to whose discovery it contributed will always remain to us and the law itself if found to be fallacious will furnish an example of the happy effect which have sometimes casually resulted from systems entirely erroneous. On the subject of this law I cannot lay before you the calculations of Professor Schweigger of Nurnberg which would I have no doubt throw some light on this curious question. They are contained in a paper read before the Philosophical Society of Munich on the 6th August 1813. It is entitled a dissertation on a general law which subsists between the distance of the planets and their satellites. From this title I should imagine that its author had discovered some law between the distances of the secondary as well as the primary planets. The volume, however, which contains this paper if it is printed has not yet arrived in this country. The third year of the 19th century produced another new planet for whose discovery we are indebted to Dr. Olbers, a physician of Bremen, who was known to the astronomical world as the author of a treatise on comets. On the 28th of March 1802 he was observing with the design of determining the position of Ceres all the stars which form the constellation of the Virgin. At a short distance from that marked 20 near which he had observed the planet about two months before he saw a star of the 7th magnitude which he had not perceived in his former observations. He had some suspicions about this star and examined her more attentively. In the interval of two hours he found that she had altered her situation and on the following two nights he ascertained that she was in motion at the rate of 10 minutes of arc in 24 hours. If the astronomer considers the accidental discovery of a comet as a piece of the greatest good fortune how much more highly must he estimate the advantage of enriching the system with another planet. Dr. Olbers enjoyed the satisfaction almost at the moment of his discovery. He had no doubt respecting the nature of the body he was viewing. Its disc was better defined than that of Ceres and it had not the least resemblance to a comet. He had besides learnt from the discovery of Dr. Herschel and Piazzi that the ancient planets were not the only ones belonging to our System. His satisfaction was not therefore interrupted by any of those doubts which had alarmed the former observers. Thus after the first few days of the discovery Dr. Olbers announced the new planet to the astronomical world. The astronomer Burckhardt and Gauss as soon as they were informed of its existence commenced their observations on it. They soon found that it revolved in an ellipse but were much astonished to discover that the inclination of its orbit was greater even than that of Ceres. A star which embraces in its course from north to south a zone of about 70 degrees wanders too far from the ordinary course of the planets not to leave at first some hesitation as to the rank which ought to be assigned to it. But since this body as well as Ceres is placed between Mars and Jupiter, and since it is not like comets subject to disappear by its recess from the Sun it has been placed among the number of the planets and it received from its discoverer the name of Pallas. The effect of this great inclination of its orbit combined with its eccentricity which is larger even than that of Mercury causes the greatest inequalities and perturbations in its motions and at the same time renders their disturbances more difficult to calculate. Burckhardt undertook some of the most laborious calculations with a view to ascertain its elements. Pallas performs it revolution round the Sun in 1,681.7 days. This is about 2 hours longer than Ceres occupies for the same course, so that the two planets are situated almost precisely at the same distance from the Sun. The eccentricity of Pallas is very considerable. She is in one part of her course almost twice as far distant as she is at the opposite part. From the united effect of these considerations it may happen that Pallas whose mean distance from the Sun is greatest may pass between Ceres and the Sun and thus to an observer situated on the planet Ceres there would be a transit or rather from the nearness of the two planets it should be called an eclipse since the Sun would probably be completely hid. If the inclination of their orbits were equal this eclipse might last months or upwards and it would perhaps not again recur for about 33,000 years, but from the difference in the inclination of their orbits it will last but a short time and will occur still less frequently. After the lapse of ages it may happen from the differences of their eccentricities that that which was the inferior shall become the superior planet and that the inhabitants of Pallas shall observe Ceres pass between themselves and the Sun. To the discovery of the planets of Piazzi and Olbers shortly succeeded that of another new planet by Professor Harding. This astronomer, the worthy colleague of Schroeter, undertook the task of forming a map of that zone of the heavens which contains the paths of Ceres and Pallas. He executed this zodiac of Ceres on twelve large sheets and not only marked down all the stars contained in the different catalogues all of which he found in Lalande's list of the 50,000 he observed, but added a great many from his own observations which had hitherto escaped the attention of astronomers. On the 1st of September 1804 in comparing these maps with the heavens he discovered between two stars whose places were known a new star which had not before been seen in that place. On the 4th September he no longer perceived it but at a short distance he saw another which he had not seen 3 days before. He immediately suspected that this might be the same as the first but that its motion had made it appear in two different places. This suspicion was soon changed into certainty: on the next day he plainly observed its movement and as the body presented [had] neither nebulosity nor the appearance of a tail he immediately concluded that it was a planet. This was soon confirmed by the other observations of other astronomers and by the calculations which resulted from them. The new planet received from Professor Harding its discoverer the name of Juno. It performs its revolution round the Sun in 1,590.998 days so that the length of its year is about 90 days shorter than those of Ceres and Pallas. Its distance from the Sun is nearly 26.5 if we consider that of the Earth as represented by the number 10. The eccentricity of Juno is very considerable; it is rather greater even than that of Pallas, but the inclination of its orbit is not so considerable being only 13 degrees. Since the commencement of this century a fourth planet has been discovered in almost every respect similar to those already described. Although a plan was as we have seen formed for the discovery of a planet between Jupiter and Mars, yet it was not strictly owing to this laborious undertaking that the three first were found. For the discovery of Ceres we are indebted to the formation of a catalogue of stars by Piazzi; that of Pallas arose from the examination of the heavens which [were] undertaken to re-discover Ceres and Juno was found from the investigations undertaken by Harding to form a chart of all the small stars in the path of the two former bodies. The fourth is the only one discovered from pursuing a plan with the express view of finding it. The hypothesis on which it was founded is certainly very extraordinary and may perhaps be controverted, but it has been too fortunate in its result to incur the disapprobation of astronomers. The idea itself and the consequences which resulted from it are equally the property of Dr. Olbers. This skilful observer to explain the phenomena presented by the smallness of the new planets and their nearly equal distance from the Sun framed this hypothesis. That possibly these small bodies might be the fragments of a much more considerable planet which some extraordinary cause had burst in pieces and that these parts continued to circulate round the Sun at the same distance and with equal velocities. This theory does credit to the ingenuity of its author and is not opposed by an argument which has frequently overturned such speculations. It is not repugnant to the principles of mechanics. It is not impossible that such an occurrence should have taken place and if such had been the case it might have happened that several fragments would revolve in nearly an equal time and the orbits of all would cut each other in two points. If however any of these parts should pass within the sphere of attraction of any large body its orbit might be considerably altered. This has perhaps happened in the present case. It is not probable to suppose that the convulsion which thus destroyed a planet should have divided it into precisely the parts which have been discovered. It is more likely that an immense number of pieces of different magnitude should have been formed, the larger parts would revolve regularly in certain orbits but possessing a considerable mass they would only be disturbed by the action of the other planets and would perform their course subject to these irregularities. The smaller fragments would be much more considerably affected by the attractions of the larger, and as they passed within the reach of each new body their orbit would be altered. Thus it might happen that some of these small fragments coming within the sphere of attraction of the Earth may be precipitated on its and thus produce those meteoric stones which are frequently discovered. It is not impossible that at the original disruption one part of the planet might be projected nearly in a right line towards the Sun. This would revolve in a very eccentric ellipse and would consequently become a comet. This hypothesis of Dr. Olbers will answer another purpose. It was observed that the law proposed by Titius was deficient before the discovery of a planet between Mars and Jupiter. The knowledge that four planets exist there would be equally fatal to this law but, according to Dr. Olbers, they are the remains of an original one and, if we suppose as is most probable that this was situated at the mean distance of all its parts, it will coincide very well with the law alluded to. From the knowledge we possess of the elements of the three planets already noticed it appears that they may at some future period come into contact with each other and that in preceding ages they might have done so before. If we were more completely acquainted with their motions it might be possible to assign with some considerable degree of probability the epoch of the original catastrophe. In pursuing his hypothesis Dr. Olbers considered that the orbits of these fragments possessed of different inclinations ought to cut each other in two opposite points of the heavens which would be the common intersection of them all. He thought that if we wished to discover the other scattered fragments of the planet that we should direct our attention to these two points. According to observations on the course of Ceres and Pallas and from calculations on the inclinations of their orbits it was found that one of these points is situated in the constellation of the Virgin and the other towards that of the Ram. The discovery of Pallas in the first of these points and that of Juno in the second seemed to confirm this ingenious hypothesis and determined Dr. Olbers in his resolution of seeking for some new planet. He resolved therefore three times annually to pass in review all the small stars which compose the opposite constellations of the Virgin and the Ram. Fortune favoured this project and on the 29th March 1807 he discovered in the northern wing of the Virgin a small unknown star whose motion from day to day was very perceptible and it was immediately placed in the rank of planets. She appeared to shine with a pure white light and to be surrounded by a thinner atmosphere than those of her colder sisters Ceres, Pallas and Juno. Vesta is the name assigned to this new planet which soon occupied the attention of the principal observers in Europe. It completes its revolution round the Sun in 1,335.2 days and its mean distance from the Sun is nearly 24 if that of the Earth be considered as represented by ten. The eccentricity of its orbit is considerably less than that of the other recently discovered planets and the plane of its orbit is inclined to the ecliptic only at an angle of 7 degrees. It results from the values which have been assigned to its elements that Vesta is about 36,000,000 miles nearer the Sun than Ceres, Pallas and Juno; that the inclination of her orbit is not much greater than that of Mercury and that its eccentricity is nearly equal to that of Mars. From these causes it appears that she must be much less exposed to perturbations from the action of Jupiter and that they will be more easy to calculate. In fact Gauss, having compared his calculations with 22 observations of the astronomer Bouvard, found that they differed only 17 minutes of arc. This is certainly a wonderful degree of precision considering the shortness of the time the planet had been discovered. The examination by Dr. Olbers of the stars in the constellation of the Virgin and the Ram were crowned by a fortunate result. It must, however, be observed that the intersections of the orbit of Ceres and Pallas and the new planet have not that precise coincidence which was expected. They are separated by an angular distance of about 20 degrees. This however is too small a quantity to afford an argument against the hypothesis of Dr. Olbers. The four planets we have just considered present a singular spectacle in the system of the world, differing from all the other. They have among themselves many points of resemblance and appear associated by nature to the destinies. Collectively they fill up the vacancy which was thought to exist between Mars and Jupiter. Placed at a mean distance between these two planets they describe orbits of nearly equal magnitude and move with nearly an equal pace. Several philosophers at first refused to bestow the name of planets on these stars whose discovery signalised the commencement of the 19th century. The principal reason was their extreme smallness which might make these bodies be regarded as of an inferior order. Dr. Herschel proposed to distinguish them by the name asteroids. But these bodies revolve round [the] Sun as well as the others; like them their elliptical orbit is but little elongated. They are scarcely smaller when compared to Mercury than that body is in respect to Jupiter. The magnitudes of the planets are subject to no law: they have no relation to their distance from the Sun. Mars is further distant than the Earth yet it is smaller. Jupiter is much greater than Saturn though this latter body is most remote. It has been objected that these planets are without the limits of the ancient Zodiac, but the bounds of this Zodiac were fixed principally on account of Venus. They would have been much less if this planet had been unknown. It may therefore be extended at will from one pole to the other, that is to say they are artificial limits of no real utility and may be abandoned altogether. In fact there is no reason why there may not exist in the heavens planets whose orbits cut the ecliptic at right angles as the equator of Venus nearly does and as the satellites of Uranus actually do. We should beware of establishing from partial observations arbitrary laws which future discoveries may oblige us to abrogate. The discussion is however merely verbal and could not long engage the attention of astronomers. The denomination of planet is now universally applied to designate these newly discovered bodies and also all of a similar nature which may be hereafter found. The hypothesis of Dr. Olbers respecting the formation of these planets by the explosion of a former one has been considered with some attention by Lagrange whose numerous investigations have contributed much to the splendid progress of Physical Astronomy. he calculated the force necessary to project a body from our Earth so that it should revolve in a very eccentric orbit and become a comet, and found that if a body could be projected with a velocity about a 120 times as great as that of a cannon ball it would quit this globe and revolve in an elongated ellipse round the Sun. Applying similar principles to the case of other planets he found that if a large planet had existed between Jupiter and Mars and if by some internal cause it should be torn asunder, its parts might form small planets and circulate round the Sun in nearly circular orbits provided that at their first projection they moved with a velocity only about 20 times greater than that of a cannon ball. From these calculations it results not only that the hypothesis is a possible one but also since the power required to produce the effect is not exhorbitant it receives from them a certain degree of probability. It appears that the only method of increasing the evidence on which it rests would be by discovering other similar bodies whose orbits intersect those of the small planets already known nearly in the two points before alluded to. Should this ever be the case it will indeed afford us satisfactory evidence and in fact the only kind which the subject admits. It has already been observed that these new planets are by far the smallest of any we are acquainted with and which revolve as primaries round the Sun. Of their magnitude different opinions have been entertained. Schroeter of Liebenthal whose observations have acquired deserved reputation estimated their apparent diameter at from 2 to 5 seconds of arc. This however differs widely from the opinion of Dr. Herschel who undertook a series of experiments of a curious nature purposely with a view to ascertain the diameter of these objects. He found that their extreme smallness rendered the common methods inapplicable and therefore resorted to others of his own invention. Having heated some sealing wax and drawn it out into small threads he passed the ends of them through the flame of a candle. They consequently had at the end of each thread a small round globule of wax. It was now necessary to measure the diameter of these balls and this was accomplished by means of a solar microscope which projected their images on a sheet of paper and their size was thus ascertained with great accuracy. A row of these waxen balls thus arranged was placed on a card at the distance of 7 or 8 hundred feet and viewed with a telescope. By knowing the distance at which they were placed and their real diameters it was easy to calculate the angles under which they would be seen. For the discovery of the planetary atoms and of numerous other bodies with which we are acquainted the unassisted eye would be utterly incompetent. It is only by the aid of instruments of a most powerful kind that the observations which I have had occasion to notice can be repeated. They are generally carried on by means of the reflecting telescope. Some account therefore of an instrument which has contributed so much to extend our acquaintance with the magnitude of the Creation may not be uninteresting. The first idea of the reflecting telescope was undoubtedly entertained by Mersennus and communicated by him to Descartes. But this philosopher rejected the idea and endeavoured to convince his friend of the impossibility of effecting it. Some years after Gregory a young man of uncommon genius was led to the invention by seeking to correct two imperfections of the common telescope. The first was its too great length which made it unmanageable; the other was the incorrectness of the image it produced. These inconveniences he imagined might be obviated by substituting for the object glass a metallic speculum of a parabolic figure to receive the image and afterwards reflect it to a small speculum of the same metal. This was again to return the image to an eye glass placed behind the great mirror which for this purpose [was] to be perforated in the centre. This construction was published in a work entitled Optica Promota in 1660, a work which in every respect does credit to the talents of its author. But Gregory was he himself declares possessed of no mechanical dexterity, nor could he find any workman capable of realising his invention. And after some fruitless attempts he was obliged to give up the pursuit and probably had not some new discoveries in light and colours been made a reflecting telescope would never more have been thought of, particularly if we consider the difficulty of execution and the little advantage that would accrue from it according to the principles of optics at that time known. But Newton whose happy genius for experimental knowledge was equal to that for geometry and to these talents, in a supreme degree joined patience and mechanical abilities, fortunately interposed and saved this noble invention from perishing in its infant state. He also had employed himself at an early period in his life in endeavouring to improve the telescope but imagining that neither Gregory's specula were neither very necessary nor yet easily to be executed he turned his attention towards improving the common telescope. While he was thus employed about three years after the publication of Gregory's book he made that celebrated discovery of the refrangibility of different rays of light. This convinced him of the great errors of refracting telescopes and forced him as it were to turn his thoughts towards reflectors. In a letter to Mr. Oldenburg he observes, "I understood that by their mediation optical instruments might be brought to any degree of perfection imaginable, provided a reflecting substance could be found which would polish as finely as glass transmits and provided also the art of communicating to it a parabolic figure could be obtained. "Amidst these thoughts" he adds, "I was forced from Cambridge by the intervening plague and it was more than two years before I proceeded further." It was not until the end of 1668 or the beginning of the next year that Newton returned to his studies and not relying on any artificer for making his specula he began the work himself. Early in 1672 he completed two small telescopes. One of these he sent to the Royal Society and in the letter which accompanied it he writes that though he then despaired at attaining the parabolic figure by geometrical rules he doubted not that it might in some measure be accomplished by mechanical devices. But, though the invention was admirable and the theory perfect, the discoveries, even of Newton, were not exempted from the general fatality which so frequently attends great and useful inventions, that of making a slow and vexatious progress to their authors. The fact is that, excepting an unsuccessful attempt made by the Royal Society by employing an artificer to imitate the Newtonian construction, no reflector was heard of for nearly half a century. But when that period had elapsed, a reflecting telescope was at last produced to the world of the Newtonian construction, which the venerable author, ere yet he had finished his much distinguished course, had the satisfaction to find executed in such a manner as left no room to fear that the invention would continue longer in obscurity. This memorable event was owing to the genius, dexterity and application of Mr. Hadley, the inventor of the reflecting quadrant. The two telescopes which Newton had made were 6 inches long and were held in the hand for viewing objects. 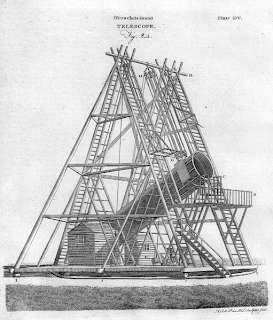 hey were equal in power to about a 6 foot refractor, whereas Hadley's was above 5 foot long, was provided with a well-contrived apparatus for managing it and was equal in power to the celebrated aerial telescope of Huygens of 123 feet in length. Mr. Hadley very liberally communicated to others the results of his experience in the construction of these instruments. About 1734 Mr. James Short of Edinburgh signalised himself by the construction of some excellent reflecting telescopes. Since that time there have been several improvements in the modes of giving them the parabolic figure and also in the composition of the metal made use of for the speculum, but until Dr. Herschel turned his attention to this subject the highest magnifying power which was usually given to telescopes did not exceed a few hundred times. The reason of this deficiency arose from the difficulty of giving to the mirror the requisite parabolic figure. In viewing heavenly bodies mere magnifying power is not always most favourable for observation. Dr. Herschel found that with different telescopes of the same magnifying power am object did not appear equally distinct. On enquiring into the cause he found that there was another property possessed by telescopes which is totally different from and sometimes interferes with the magnifying power. To this it is necessary to attend in the construction of telescopes and he designates it the power of penetrating into space. It depends on the magnitude of the polished surface. A striking instance of the difference of these two powers occurred on the erection of a 20 foot telescope image. One of its effects was that when towards evening on account of the darkness the natural eye could not penetrate far into space, the telescope possessed that power sufficiently to show, by the dial of a distant church steeple what o'clock it was, notwithstanding the naked eye could no longer see the steeple itself. Here it is clear there was a greater penetrating power; for though it might require magnifying power to see the figure of the dial it could require none to see the steeple. It is this power which is so necessary in resolving nebula into stars and it is on this account principally that Dr. Herschel's large telescope of 40 ft. in length is so powerful an instrument. The smaller telescopes will bear a magnifying power of several thousand. Indeed some of his 7 ft. reflectors will magnify 5 or 6,000 times, which is nearly a big a power as has been used in the larger ones. Their powers of penetrating into space are however very different. If that of a 7 ft. telescope be described by 20 the power of the 40 ft. will be represented by 190. These powers are both susceptible of increase but not to an unlimited extent. With respect to magnifying power Dr. Herschel thinks a telescope of 25 ft. in length may possibly admit of high a power as the nature of our atmosphere will admit. Many of his observations particularly on double and triple stars were made with powers of 4, 5 or even 6,000. The highest amplificative power which he has yet made use of is 7,200, but it is only at very favourable opportunities that such powers can be used. The penetrating power of telescopes the same skilful observer thinks can be increased. Yet this has its limits which are perhaps more easily found. The greatest penetrating power which it would perhaps be possible to give it would be about 500. This would be about 3 times that of the 40 foot telescope and the diameter of the polished surface required for this purpose would be 10 ft 6 ins.. Besides the two already mentioned there are several extraneous causes which modify the action of telescopes. These arise chiefly from the various states of the atmosphere and present some unexpected phenomena. A moist state of the atmosphere is generally favourable to observers even if it is so excessive that the vapour condenses and runs from the tube of the telescope. Wind produces a curious effect. It increases the diameter of stars. They all appear like planets. It is otherwise unfavourable. Clouds produce a contrary effect. If they gradually intervene the stars diminish in size and at last become invisible. It is rather singular that a fog which prevents objects being visible at the distance of 40 feet should yet permit excellent observations to the telescope. Frost is not a hindrance. In some cases Dr. Herschel found his feet frozen to the ground while he was making some very favourable observations. And in January 1783 we find in an extract in his journal, "I made a number of very delicate observations yet at four in the morning my ink was frozen and at 5 the frost was so intense that a speculum in the tube of my 20 ft. telescope we off with a crack and broke into two pieces". Generally speaking a calm state of the atmosphere undisturbed by any motion in the air is most favourable for telescopes of large power and aperture. These occur but rarely and it is calculated that there are not perhaps more than 100 hours occur in the course of a twelve month which are favourable for observations with Dr. Herschel's 40 ft. reflector.